CooksRecipes has quality, kitchen-tested recipes for a variety of appetizer and dessert fondues that are perfect for parties and entertaining. 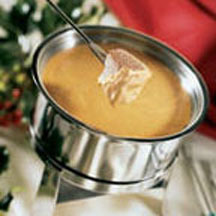 Serve this elegant fondue of smoked cheddar, gruyère and pepato cheeses with cubes of sourdough bread for dipping. 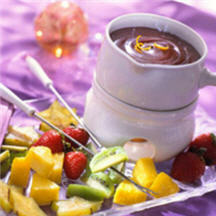 Update chocolate fondue with a hint of coffee, and serve it with meringue cookies as crispy dippers. 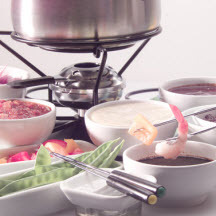 Burgundian fondue or fondue bourguignonne is vegetables, raw meats and/or seafood that are cooked in a pot of simmering oil and served with a variety of sauces.